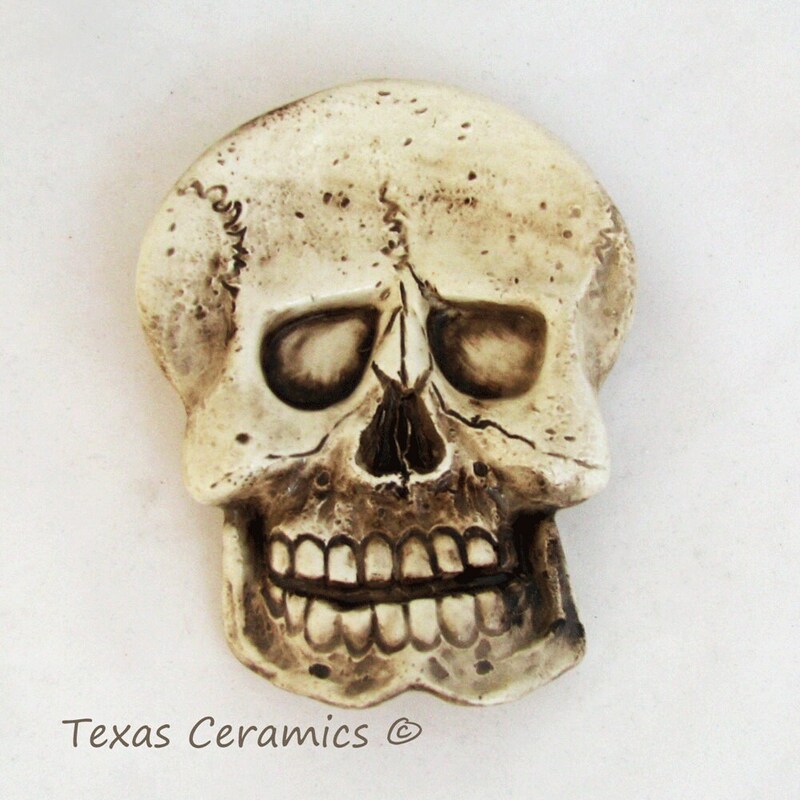 This aged skeleton skull is ceramic and will help complete any skull ware pirate theme decor or add to your dark side. A bit strange to say the least, but lots of fun. The aged human skull can be used as a tea bag holder or spoon rest but can be used as a desk accessory or just about anywhere you desire. It does grow on you and is a real eye catcher - Makes a great GAG gift too! How is it made? 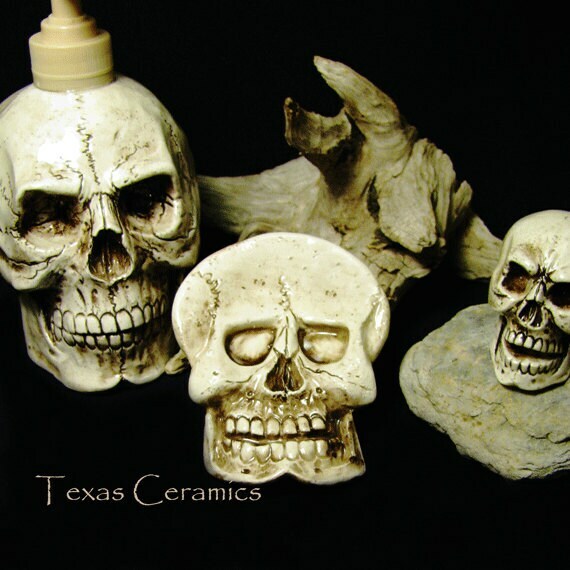 The skull is made of domestic ceramic clay, all detail is enhanced with underglaze and sealed with a lead free glaze. Each skull is fired twice in my kiln to the appropriate temperature. I have been making tea bag holders since 2004 and have a variety of designs, colors and themes available. 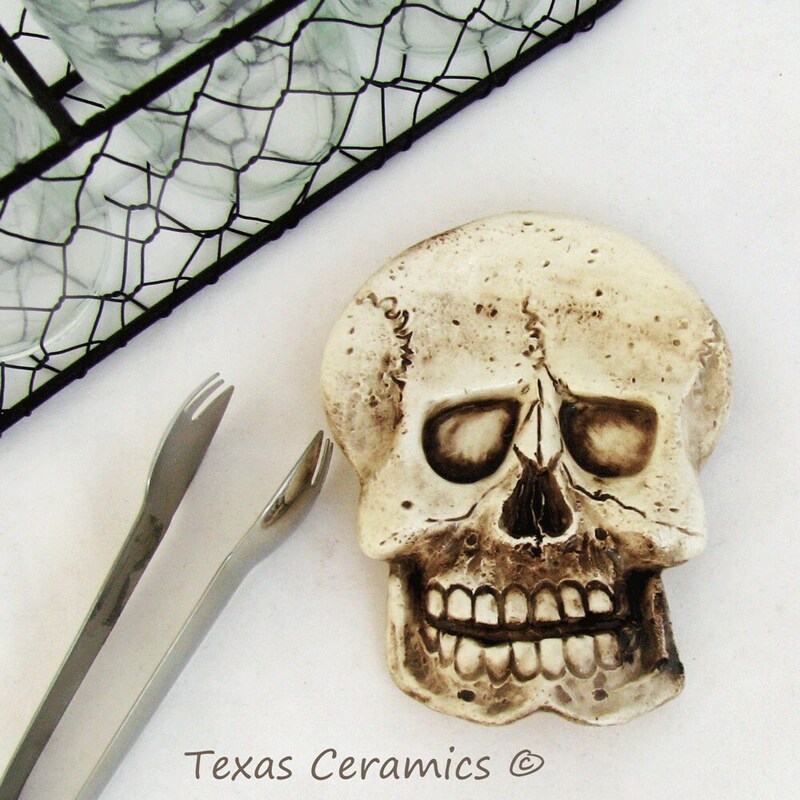 The ceramic skull is cast solid so it is dishwasher safe and food safe. Also available in solid white, jet black, deep red or with colors and designs for the Day of the Dead plus many more. Many coordinating items are available. Not only does it make an unusual spoon rest or tea bag holder, it can also be used to hold rings, earrings or jewelry, cuff links or tie tacks, coins or change, desk accessory for paper clips, tacks, staples, etc., keys, mini soap bars, candy, coffee pods, dish scrubber, vegetable brush, sewing items (needles, pins, buttons, etc.,) pet treats or daily medication, incense, small candles (tea lites) dinnerware place setting accents, wall decorations, Gift Baskets, the uses are unlimited. Available in a variety of colors as shown in the last photo, this listing is for 1 (one) aged skull tea bag holder. Thrilled with my new Spoon Rest! Quality product- exactly as described! Thank you so much for the super-fast ship time! Looking forward to future purchases! This product is fantastic! And it was shipped fast after ordering. Thank you , can't wait for the recipient to find it in her Christmas stocking! So cute. Only a pirate says that!! Great quality, can't decide just where to put it for everyone to see. Prompt and courteous. Will deal with again, SOON. Surely the coolest spoon rest on the block!